Not sure if you all know, but I`m still an undergrad university student. And the dreadful finals week starts tomorrow. Yeah, I do have two finals tomorrow. Why am I posting today then? Shouldn`t I be studying? Maybe because I`m so awesome that I wanted to share this recipe to make your day better before I disappear into my textbooks. Or, I`m just procrastinating. The thing EVERY SINGLE college student is good at. ;) But, once Thursday is over with, my third year as an undergrad is officially over. This makes me incredibly sad, because frankly, I`m not ready for the real world. I have ONE YEAR LEFT. gah. sigh. urgh. Joking aside, these were amazing though. I would definitely make these again. They`re so simple to make as well! I used a boxed mix just because I had one left from the time I bought 3 boxes when there was a sale. :) But feel free to make the brownie batter from scracth. It`ll only make this brownie better. All of my lovely taste testers LOVED these and gobbled them up! Then they told me how awesome I was and to make them again. LOL. 10. Bake for 30-35 minutes, to test, use a toothpick and poke the center. It should come out crumbly and a bit gooey, but not look like wet batter. Cool in the pan. 11. Cut into pieces and serve. Enjoy! 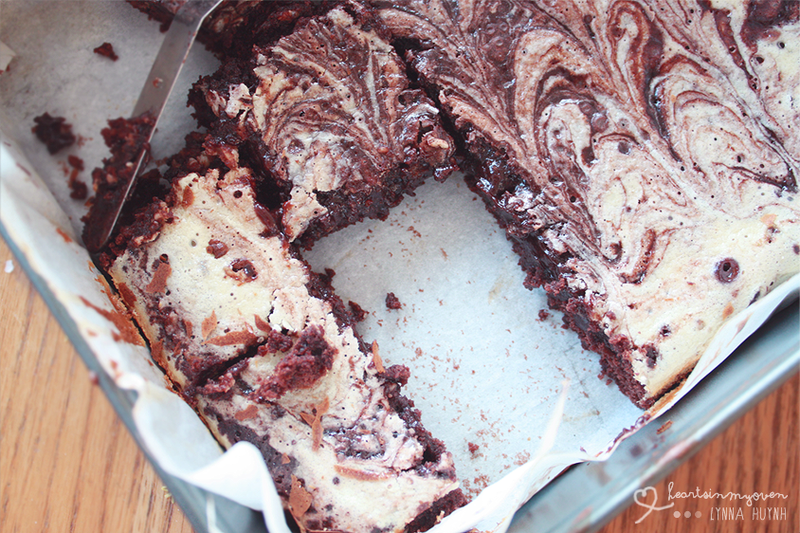 I love brownies with cream cheese! Looks delicious :)I like the design of your blog as well! I love cheesecake brownies! The best of two worlds :-) Good luck on your finals! Thank you! Thank goodness they`re over! for real...wow! This looks great Lynna! I love your materials needed section too - what a great idea!